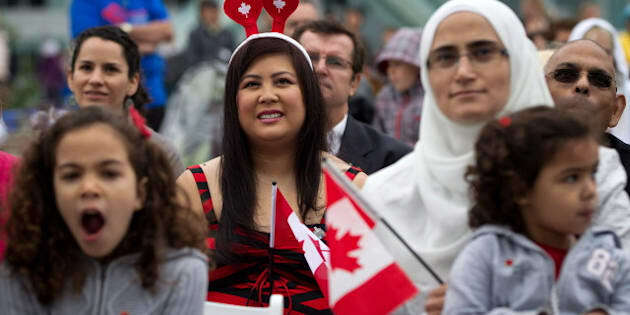 While most people in this country are in favour of welcoming new immigrants, a large portion of the population believes Canada’s policy is too open. That’s the conclusion from an interactive voice response (IVR) poll conducted in February by EKOS Research. It found a majority of Canadians believe there are too few or about the right number of immigrants in Canada. Thirteen per cent believe the number is too low, while 41 per cent said it is about right. Canadians born outside the country were more likely to feel this way, with 19 per cent saying there are too few and 44 per cent that the number is about right. Still, 40 per cent of all respondents said there are too many immigrants in Canada, including 43 per cent of native-born Canadians. Among first-generation Canadians, 27 per cent feel there are too many newcomers. It is difficult to assess whether that number is increasing or decreasing with EKOS’s polling. From 1994 to 2005, the number of Canadians saying there were too many immigrants fell sharply from just over 50 per cent to under 30 per cent. But then EKOS changed their methodology, replacing live callers with the IVR method, in which respondents press buttons on their phone to answer pre-recorded questions. After doing so, the number saying there are too many new Canadians jumped back up to over 40 per cent. Frank Graves, president of EKOS Research, writes in the poll’s report that with the new methodology “respondents are [apparently] less abashed sharing notions that they do not like immigration ... with the impersonal robot.” He goes on to say that “we do not believe that opposition to immigration is actually up when we discount the mode effect of eliminating a live interviewer.” As to which method is more reflective of reality, Graves tends to think "the impersonal interview is more accurate of true feelings." Age was one predictor of how open Canadians are to immigration. The percentage who said there were too many immigrants was 38 per cent or higher among those over the age of 25. Yet, among those under 25, that number dropped to only 28 per cent. Level of education also played a factor. Forty-eight per cent of Canadians with a high school education or less felt there are too many immigrants in Canada, compared to 27 per cent of university graduates. Interestingly, the poll contradicts widespread beliefs about Quebec, where controversies over “reasonable accommodations” have erupted. Residents of Saskatchewan, Alberta, and Ontario were more likely to respond that there are too many immigrants than Quebecers. On the question of whether there are too many visible minorities, Quebecers were the least likely in the country to agree — by a significant margin. It would appear the debate over Canada’s immigration policy — one that has raged since before Confederation — is far from settled.